Las Vegas, NV (January 14, 2014) – Rock Island Armory today announces the expansion of the company’s TAC Series of tactical pistols built on the 1911 and 2011 platforms. The new offerings are aimed at the rapid growth of gun owners who are looking for concealed carry options as well as the addition of .40 S&W caliber options. • Full size 2011 and 1911 platforms chambered for the .40 S&W load. 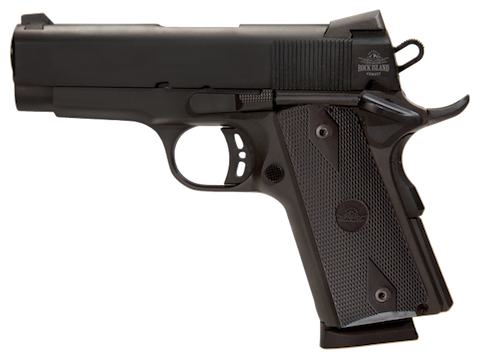 • Midsize 2011 and 1911 platforms chambered in .45 acp, 9mm, 10mm, and .40 S&W caliber options. • Compact 2011 and 1911 platforms chambered in .45 acp and .40 S&W caliber options. The new TAC Series pistols are covered by Rock Island Armory’s lifetime warranty and support. For more information about the new Rock Island Armory pistols visit the new Armscor and Rock Island Armory website at www.rockislandarmory.com.